After his release from jail in 1942, he was all set to give due shape to his dream of setting up a monument in honour of the great leaders of national movement of the region. Through his tour, he collected donations of Rs. 2,00,000. Jabalpur Municipality gave 10 acres of land in middle of Gol Bazar. A separate trust was formed comprising of Pt. Ravi Shankar Shukla, Pt. 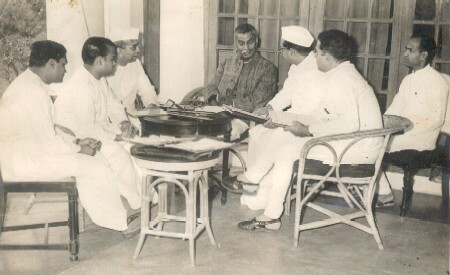 Dwarika Prasad Mishra, Ghanshayam Singh Gupta, Lakhsmi Narayan Das and Seth Hari Bhai as trustees. Government architect, Karjawankar was entrusted with the responsibility of designing this monument. After the construction of the monument, picture from national movement were made to throw light on the sacrifices by leaders of the time. A museum, a library and a cultural centre also found roof under the same stand. Dr Rajendra Prasad, the first President of the country laid the foundation stone of this monument. A grand function was organised, whereby dignitaries from all over the country participated. 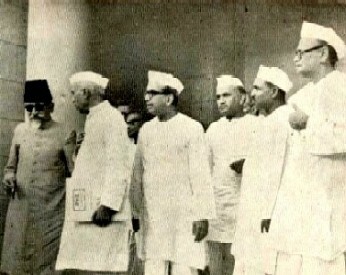 Prime Minister Jawaharlal Nehru inaugurated the monument, in 1956. Again, the time had come for the Central and provincial assembly elections. No doubt, these were held unopposed. Congress went into the assembly with same number of members as in 1923, 26 and 34. 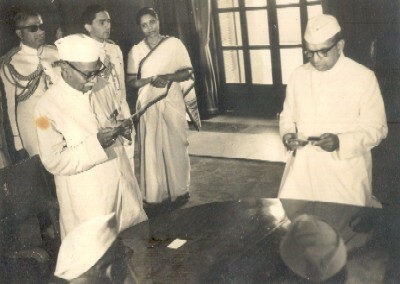 The Congress Ministry of the Central Province was formed on April 24 in 1946. Govind Das ji was again elected for the Central Assembly. He brought several work proposals to the floor. Significant among these were inefficiency of Government of India over apartheid policy in South Africa, and the rights of Indians in East Africa. In addition to this, he also raised the issue of the Japanese taking Indian labourers for the Death Railway project at Siam and Burma. The first session of the Assembly was an important one as proposal for the release of prisoners of Indian National Army (INA) was moved. On September 2, 1946, temporary national government came to power at the centre. It was during this period, India achieved independence. A Constituent Assembly was given shape to formulate the constitution of the country. The first session took place from November 17 to December 12, 1947. Govind Das ji gave his speech in November 1947 in Hindi. Most significant event was the introduction of Gau Raksha bill by Govind Das ji on December 3, 1947. After the formation of National government, he drew his attention towards foreign policy. It for this reason, he was sent time and again as head of the delegations abroad. The session continued till October 6, 1949. The body came into being in order to form the Constitution for Independent India. Dr. Rajendra Prasad was elected the President of the body. Pt. Jawaharlal Nehru highlighting on the objectives and working of the body presented the first proposal on December 13, 1946. Seth Govinddasji was also a member of this assembly. Many sub-committees were formed under this parent body. But among these two were considered major ones. 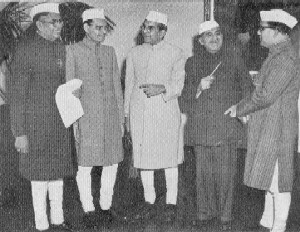 These were a committee under the leadership of Dr. Ambedkar to prepare a preamble for the Constitution and committee giving suggestions on issue of Minority. Time to time, discussions were held on various issues. But the constitution was finally accepted on January 26, 1950. Govind das ji had been a supporter of Hindi language since the beginning. After adoption of the Constitution, questions were raised over national language. There were leaders who supported English as the national language, since pre-Independence all working of the central assembly & government was carried out in English. While there was another group who were in favor of Hindustani, a mixture of Arabic and Persian, being made the national language. It was Govind Das ji who came forwarded and prepared a letter of oath which stated that Hindi be made the national language and Devnagri as national script. He decided to have signature of members of the Constituent Assembly as a mean of their consent over the issue. Purushotamdas Tondon was a great support to Govind Das ji in this initiative. 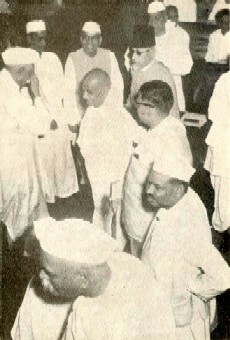 Within no time, Govinddasji received support of A. Ayangar, Nijlingapa, Hanumathaiya, Pattabhi Sitaramaiya, Gopalswami Ayangar, K. M. Munshi, Rohinikumar Chaudhary, Dr. Shayam Prasad Mukherjee, etc. In total he received consent of 396 members of the Constituent Assembly. On the final day of voting members casted their votes and the results came in favor of Hindi, with a very small margin. Congress candidates made hectic preparations for the country’s first election. A fair like scene was visible at New Delhi during this period. At that time, 12 parties were there from all over the country. Each were allotted separate election symbol. The symbol for the Congress was two bulls with plough. After allotment of symbols, each candidate of the party went back to his areas for electioneering. For Congress, Pt. Jawaharlal Nehru was the star campaigner. Seth Govinddas ji was also a member of the central Congress Working Committee. Electioneering commenced in Madhya Pradesh also. Since Govind Das ji was the President of the Regional Congress Committee, therefore all responsibilities came upon him. During this period he visited, various places. The Electioneering by Pandit ji in the Madhya Pradesh started from Raipur. He then visited Bilaspur, Khandwa, Bahranpur and then Jabalpur. The results proved in favour of the Congress party. Leaving aside Madras, Orrisa, Pepsu, Travancore -Cochin, Congress was in majority in other seven regions. Out of 479 members, 363 members from Congress were elected. Total 29 members were elected for the parliament from the region. Govind Das ji won by majority votes. It was the year 1950, when the meet of Commonwealth Parliamentary Association was organised at Wellington from November 27 to December 1. The meet takes place every two-years, at any commonwealth country. After Independence, India too became a commonwealth nation. The Indian delegation to this meet in New Zealand was led by Govind Das ji. The other members of the delegation included Mr. Sighwa, Chaman Lal Shah, Devkant Varun and Mr. Vekantraman. The organisation dates back to George Vth days and it came into being in 1911. The body was formed to increase interaction between countries under the colonial rule of England and to encourage flow of thoughts among them. The delegation under the leadership of Govind Das ji left for News Zealand by air from Calcutta. During the five day long programme, discussion on 5 topics were held on separate days. These included financial relation and development of Common wealth nations, relation with countries of Pacific region and their security, transfer of population from one commonwealth nation to another and foreign policy. Each day, delegation heads from various countries presided over the proceeding of the meet. On the fifth day, Govind Das ji presided over the council. The major issue raised by him was the immigration policy. During this visit, he also went to Australia, Fiji and Malaya. Later a travelogue was written by him based on his visit to these nations.